As I slogged my way through the oppressive humidity tonight to walk the dogs, I wondered how such miserable weather could be named after animals that give us such joy. Well, according to the Wikipedia entry for Dog Days, it really doesn’t have anything to do with dogs at all. It appears the ancient Greeks and Romans believed that the hot weather of summer was caused by the star Sirius being in close proximity to the sun. Sirius is the brightest star in the Canis Major (Latin for “greater dog”) constellation, so it is known as the Dog Star. Canine dentistry is the topic for Sugarloaf Mountain Vineyard’s Dog Days event on Saturday, July 23. The winery’s upper patio will be open as a dog park from 10:00 a.m. to 12:00 p.m., then at 1:00 p.m. Dr. Mark Smith will lead a discussion about canine dentistry. Denny Grizzle will perform on the patio from 2:00 to 5:00 p.m. The vineyard is located at 18125 Comus Road, Dickerson, MD 20842. Also on Saturday, July 23, volunteers from Homeward Trails Animal Rescue will be at Fur-Get Me Not’s Florida Ave. location washing dogs as a fundraiser. From 9:00 a.m. to 12:00 p.m., you can sit back and enjoy the air conditioning while someone else gives your dog a standard bath for just $20. Not only does your dog get to cool off with a bath, you get to support a great cause and take home a clean pup! Homeward Trails is a non-profit that finds homes in Virginia, Maryland and D.C. for dogs and cats rescued from high-kill animal shelters or whose owners could no longer care for them. Fur-Get Me Not is at 1722 Florida Avenue, NW, Washington, DC 20009. Last, but definitely not least, I am thrilled to report that Petfinder.com’s Big Birthday Adoption Event exceeded their goal of 15,000 adoptions last weekend to celebrate their 15th birthday! Yes, when all the participating shelters reported in, more than 15,700 animals had been adopted. You can read some of their happy stories on the Petfinder blog. Stay cool! 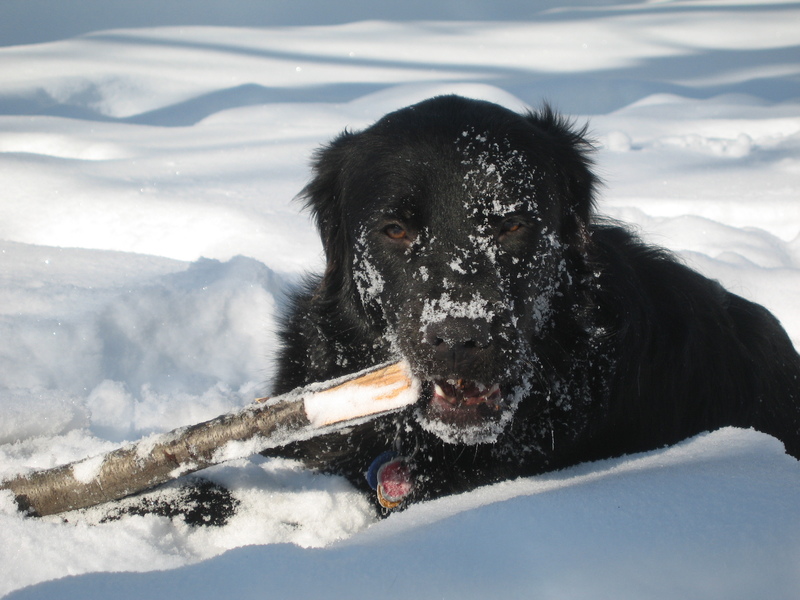 My Petfinder baby Sundae enjoying Snowmaggedon in 2010.